March 7 (UPI) — Dwyane Wade stopped by Marjory Stoneman Douglas High School on Wednesday to visit with students following the Feb. 14 shooting on the Parkland, Fla., campus. The Miami Heat star was welcomed with screams, high-fives and applause as he walked through the school. “First of all, I am so excited to be back in this city, be back in this state,” Wade said when addressing the students. 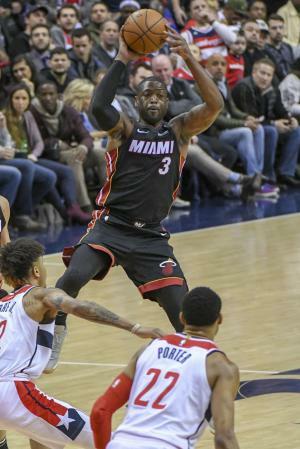 The 36-year-old NBA veteran spent the first 13 seasons of his decorated professional basketball tenure with the Heat, before stints with the Chicago Bulls and Cleveland Cavaliers. He was traded back to the Heat on Feb. 8. One of the 17 casualties of the shooting — 17-year-old student Joaquin Oliver — was buried with Wade’s No. 3 Heat jersey. Wade teared up when he was notified of that gesture last month before writing Oliver’s name on his shoes for a game against the Philadelphia 76ers on Feb. 27 in Miami. The 12-time All-Star went on to make the game-winning shot against the Sixers that night at AmericanAirlines Arena. Wade also met up with Oliver’s family on Saturday after the Heat beat the Detroit Pistons in Miami. He handed them a pair of customized basketball shoes, which included the Stoneman Douglas Eagles’ logo and Oliver’s name. He also gave the Oliver family one of his jerseys. Wade’s 16-year-old son, Zaire, attends American Heritage School in Plantation, Fla., which is located about 20 miles south of Stoneman Douglas.